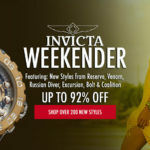 In honor of Bastille Day, the French national holiday celebrating the storming of the Bastille on July 14, in 1789, our Watch Collection essentials today is focusing on prestigious French wristwatches. 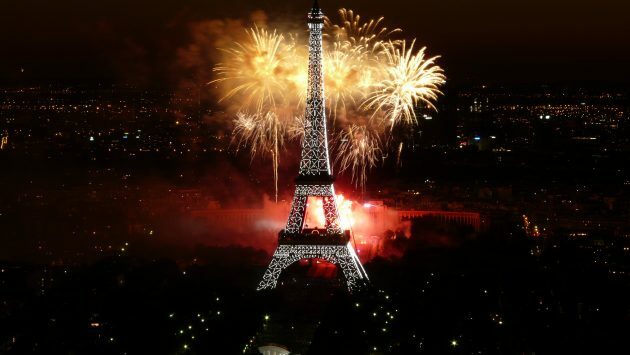 From fine wine and champagne to trend-setting women’s and men’s designer fashions along with fine fragrances, the French are highly regarded around the world for a wide array of luxury imports. 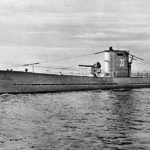 Although the Swiss are noted for their premium crafted timepieces, several French watch brands hold prominence in the world of horology: Cartier, Chanel and Christian Dior. Interestingly, each of these highly regarded French watchmakers originated in France and each still has headquarters in the nation. However, their high-end timepieces do hold the distinction of being Swiss-made. Cartier is one of the most respected, if not highly recognized jewelers in the world today. Founded in Paris, France in 1874, the Cartier name evokes the highest level of excellence and prestige. 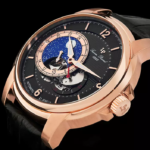 The brand holds the distinction of producing the first wristwatch for men, the Santos in the early 1900’s, when founder Louis Cartier designed a wristwatch as a favor to pilot Alberto Santos Dumont to wear on his wrist when flying. 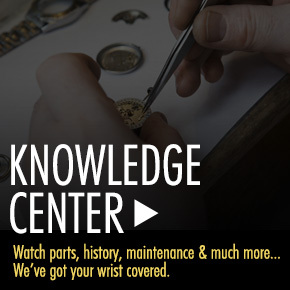 Cartier watches today are produced at the brand’s production facilities in Switzerland. 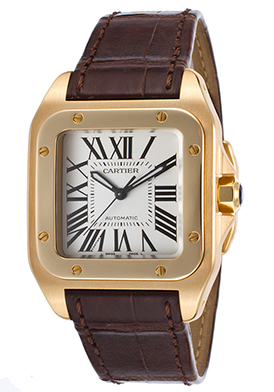 The Cartier Santos 100 Automatic men’s watch is an extraordinary choice. This premium crafted Swiss made automatic timepiece features the updated signature Santos case in brushed and polished 18K yellow gold. The handsome brown alligator strap features a deployment clasp buckle for added convenience. The signature contoured square bezel in polished 18K yellow gold features decorative screw accents. The matte white dial has luminous black outlined hands and black Roman numeral hour markers. The octagonal shaped crown on the case side is topped with a blue cabochon stone. Features include a scratch resistant sapphire crystal above the dial and water-resistance to 100 meters. The Cartier Santos 100 men’s watch is 33mm wide and 11mm thick. 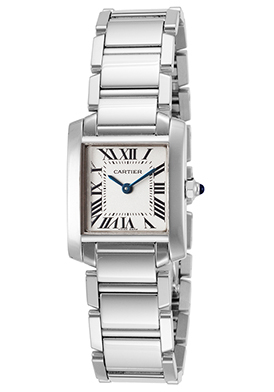 The Cartier Tank Francaise women’s watch shines with understated elegance and allure in 18K white gold. The signature rectangular shaped case in 18K white gold and matching triple-link bracelet in18K white gold are highly polished to a mirror-bright patina. Bracelet has a double folding butterfly clasp for added security. 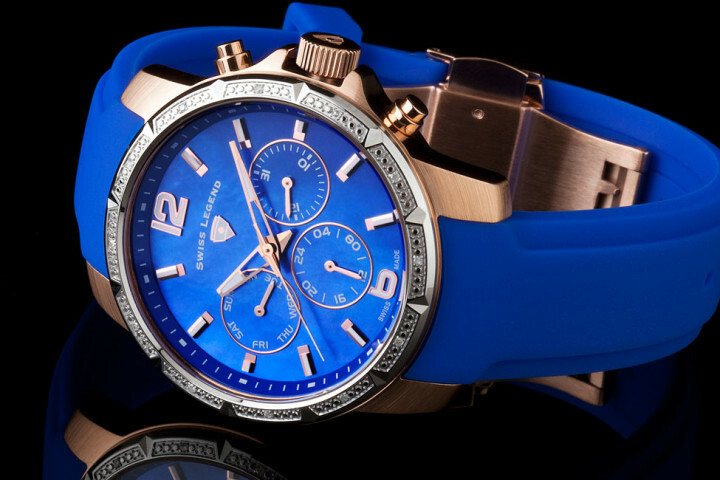 The octagonal shaped crown on the case side is topped with the signature blue cabochon stone. The matte white dial features blue sapphire colored sword hands and black Roman numeral hour markers. Features include a scratch resistant sapphire crystal above the dial and premium Swiss-made quartz movement for precise time-keeping accuracy. Cartier Tank Francaise women’s watch is 20mm wide and 6mm thick. Nothing says haute French wrist apparel more than the fashion brand Chanel. This highly regarded French fashion house not only made Little Black Dress, costume jewelry and women’s pants fashion staples, Chanel also started the ceramic watch trend in the early 2000’s with the introduction of the J12 Ceramic Diamond watch, which is still in production today. Beset with glamour and radiance, the Chanel J12 Diamond women’s watch in lustrous black ceramic is pure enchantment. The contoured round case and matching triple-link bracelet are crafted to perfection in lustrous high-tech black ceramic. Shimmering round-cut diamonds are pave-set to glowing perfection on the polished stainless steel bezel with an attractive u-notched detailed rim. The polished stainless steel crown with fluted detail is topped with a black ceramic cabochon cut accent. The dramatic black dial shines with luminous white hands and Arabic numeral hour markers. A window between the 4 and 5 o’clock hours reveals the automatic date calendar. Features include a scratch resistant sapphire crystal above the dial and water-resistance to 200 meters or 660 feet. Premium Swiss-made quartz movement inside assures you of precise time-keeping accuracy. 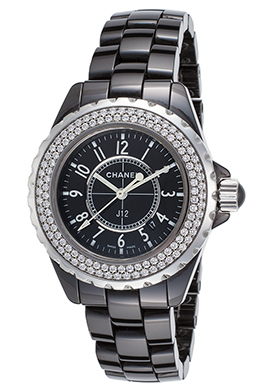 Chanel J12 women’s watch is 33mm in diameter and 11mm thick. Christian Dior is another brand synonymous with French high-fashion and couture. Dior is celebrated for its innovative fashion sense, as well as form fitting designs and silhouettes. This innovative spirit is captured in the Christian Dior Christal women’s chronograph featuring a glowing array of shimmering diamonds and sparkling red sapphires. The contoured stainless steel case is polished to a lustrous mirror-bright glow and is presented on a bright red rubber strap with faceted red sapphire accents. A spectacular array of round-cut diamonds and red sapphire stones dramatically adorn the perfectly round stainless steel bezel. The bright red dial shines three sub-dials, luminous silver tone outlined hands and raised Arabic numeral hour markers. Features include an automatic date window, 1/10th of a second, small-second and 30-minute registers. Additional features include quality Swiss-made quartz movement inside and water-resistance to 50 meters. 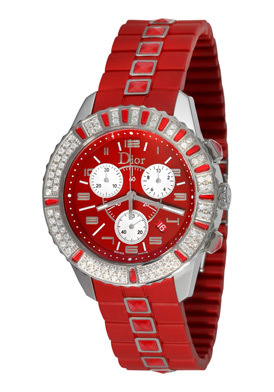 Christian Dior Christal women’s watch is 38mm in diameter and 12mm thick.